The Order of St. Saviour--more commonly known as the Brigittine Order--was founded in 1346 by St. Brigit (Birgitta) of Sweden (d. 1375). The Order soon spread across Europe, and in 1415 Henry V laid the foundation-stone of the only English Brigittine monastery, at Syon House, Isleworth. 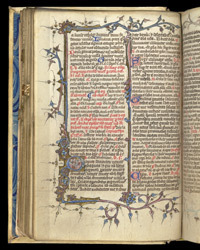 All English Brigittine manuscripts, including this one, therefore, come from Syon. In the initial 'O' the Three Wise Men come to adore the Christ Child.